So you’ve planned an upcoming vacation to Hilton Head, maybe for Spring Break, summer vacation or just a winter getaway. Packing is one of the hardest parts of going on vacation, so we’ve got some tips of what you should (and shouldn’t) bring along with you on your next Hilton Head getaway when you book through Sunset Rentals. Several days worth of clothing and swimwear — You’ll have access to a washer/dryer in your vacation rental, so you’ll be able to wash and re-wear the same clothes if needed. A camera to capture all of your family’s special moments. A car so you can get around the island. You’ll be able to get many places by bike, but a few spots may be a bit too far to pedal, especially for young kids. Beach towels – Beach towels are not supplied in our vacation rentals, so bring at least one per person that you can re-wash. Please don’t use bath towels as beach towels. Toys and games – If you’d like to be sure your kids have activities to do in the Hilton Head vacation home and in the pool, bring along some of your own toys and games. Just check under couches and beds before you leave to make sure you’ve gathered everything. Food – You’re welcome to bring your own food, snacks and drinks that you can prepare in the kitchen of your vacation villa. You may also choose to use one of our convenient grocery shopping services to have your villa stocked when you arrive or you can shop on the island yourself. Beach chairs – Bring your own beach chairs or rent them from a local rental operator, such as Hilton Head Outfitters. Hairdryers – We do not supply hairdryers in each of our units, so please bring your own. Kitchen equipment – Our Hilton Head vacation villas are furnished with most basic items you’ll need to prepare food, including dishes, microwaves, stoves, ovens and glassware. Clothing for every day you’ll be visiting – You’ll be able to wash and re-wear clothes, so no need to overpack. Linens and bath towels – Your Hilton Head vacation home will be supplied with basic linens and bath towels. Bikes – Feel free to bring your own bikes or we can arrange Hilton Head bike rentals for you. Movies – Most units have DVD players and big-screen TVs, so feel free to bring along a movie or two to watch during your stay. 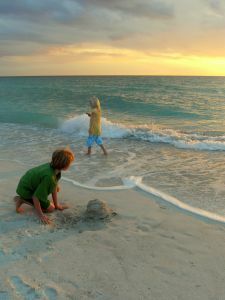 For more information about Hilton Head vacation rentals, visit www.SunsetRentals.com or call us at 800-276-8991.